The PREXISO PLC360G Green-Beam Self-Leveling Cross-Line Laser uses green-beam technology, which generates lines is 2 times brighter than standard red beams . The horizontal line coverage gives the user the ability to line up an entire room from one setup point. It also features a vertical projection of 120° for cross-line applications. System self-levels and indicates out-of-level condition, to help ensure an accurate layout. It locks the pendulum after the laser is switched off for secure transport. The PREXISO PLC15 projects bright crossing horizontal and vertical lines for various leveling and layout applications. It provides highly visible lines and points that can be turned on independently or together for horizontal level, vertical level and plumb transfer applications. This laser has a visible range of 65 Ft. 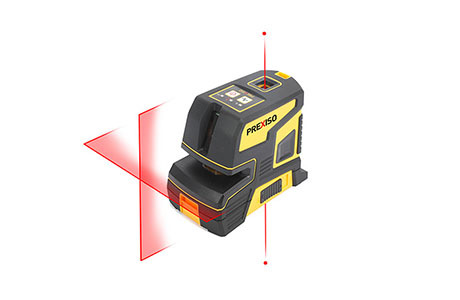 The PREXISO P2LC15 is a two-point self-leveling alignment laser with cross-line. It delivers two-in-one versatility for power users who perform a variety of tasks involving squaring, plumbing and leveling. Operators no longer need two tools to square a room for walls or transfer points for ceiling installations. Its smart pendulum leveling system self-levels and indicates out-of-level, and it locks at any angle in manual mode, leaving hands free to quickly complete layout.